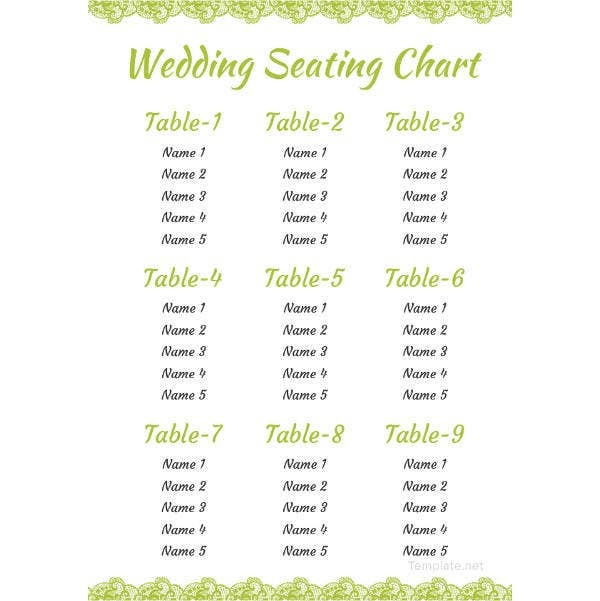 Wedding seating is not an overcomplicated task. But it is often overlooked till the last moment. Needless to say, it results in a havoc. Have you sorted out your guest list? Now decide where are you going to seat the guest list to make them happy. Are you looking away for some digital seating chart templates? 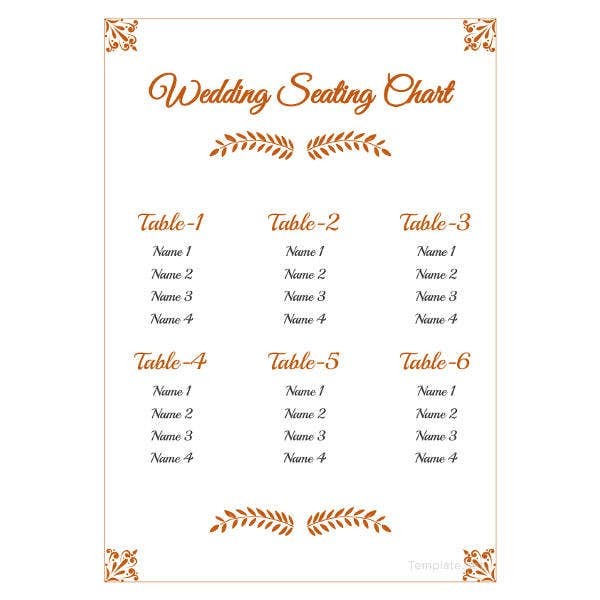 Below are some wedding seating chart templates for your use. They are so visual. They look so real with the images of furniture. All in all, they are so adorable. This gives equal importance to both Bride and bridegroom. The two portions mentioned here are for both genders. Now you can prepare individual lists and make them seat accordingly. A good seating arrangement makes the wedding goes hassle-free. 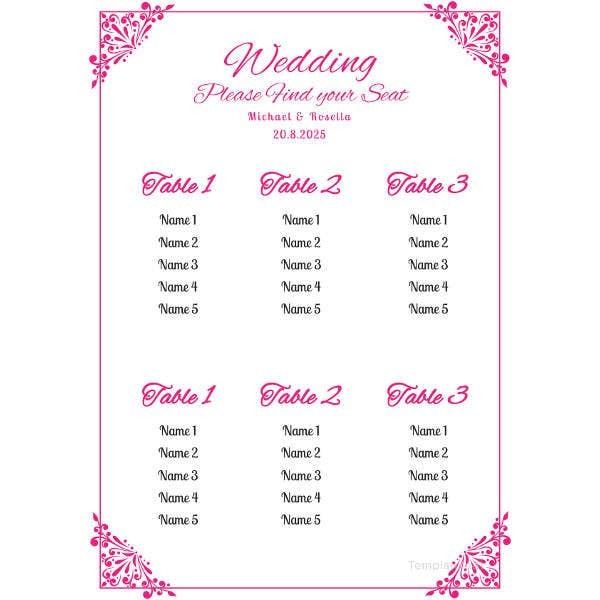 You can now prepare your wedding seating on this A4 and/or Us letter sized word document. All the fonts used are free. If you have two rows of seats, this will definitely fit your requirements. You can divide it further into two rows or make it one single row. The choice is yours. 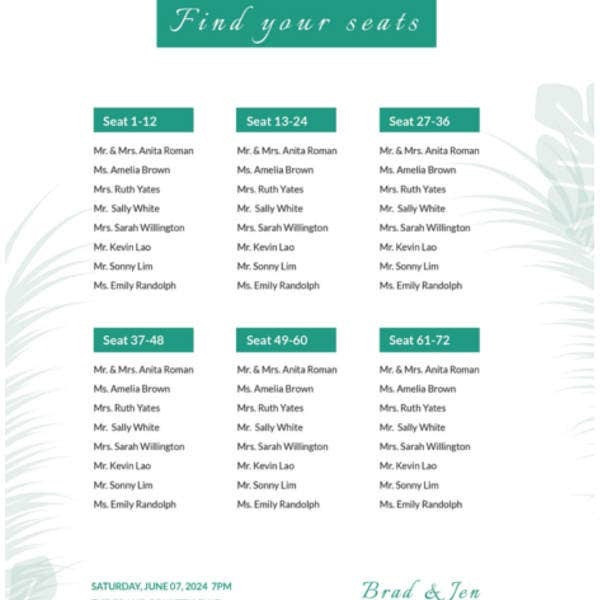 This wedding seating chart makes it possible to arrange seats and make the guest sit in a decent row. The rows are having enough breathing space so that it is easy for the guests to move around. 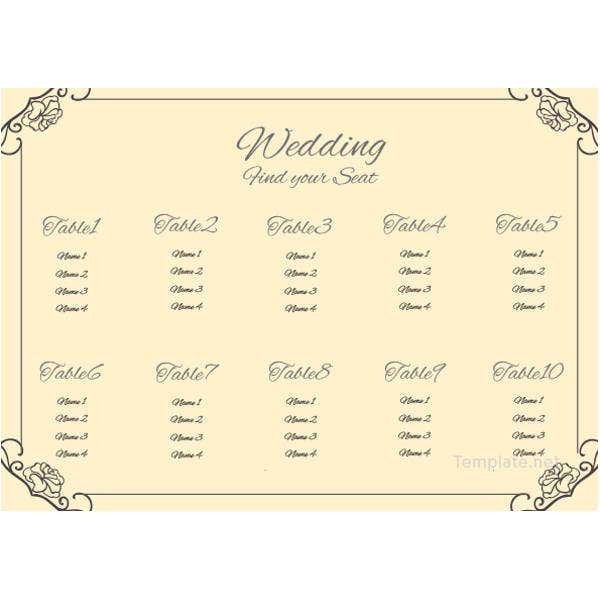 You can display this Wedding Seating Chart for your grand reception. Thus make your evening function so functional. All the seats are highly customizable. Also, this is print-ready. 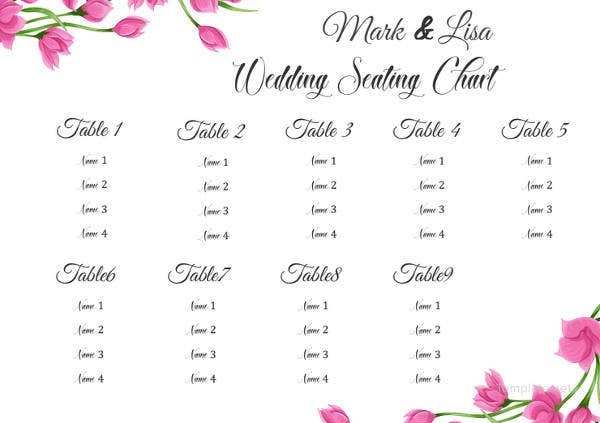 This Wedding Seating Chart follows a minimalistic approach. 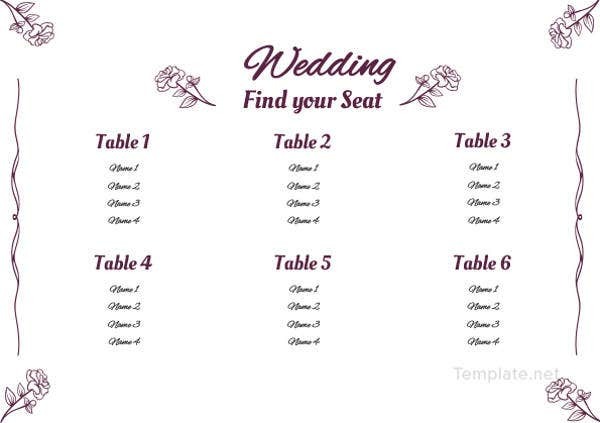 If yours is a personalized and private wedding affair, this wedding seating chart helps you to have a clean and neat seating arrangement. Though there are no images of seats here, the names resemble the seating system. Pin it to the notice board in your reception hall. It let the guest list go and sit in their seats on their own. 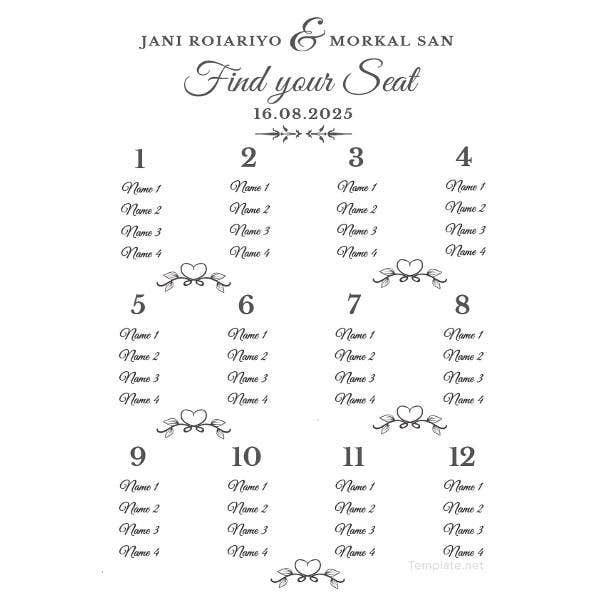 This Wedding Seating Chart comes with a beautiful design. If your wedding reception is going to be celebrated at a celestial spacious reception hall, you can use this variety seating system. 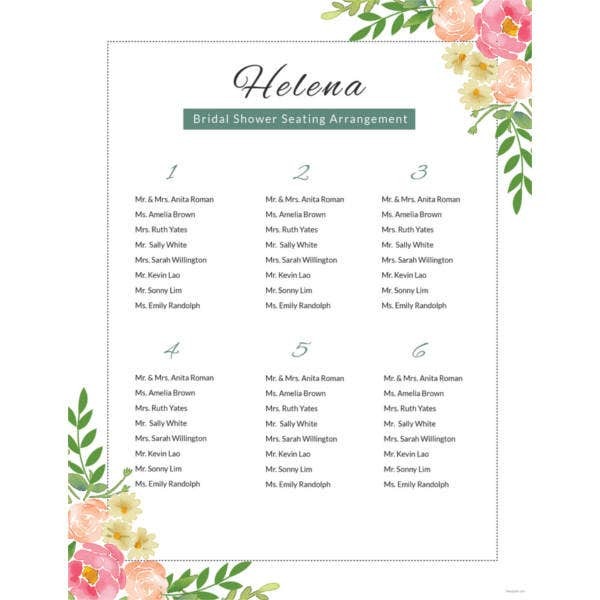 This Wedding Seating Chart is placed on a white background and is surrounded with a beautiful flower pot along with a watch, pen, and few pencils. Other than that, the design is so colorful. 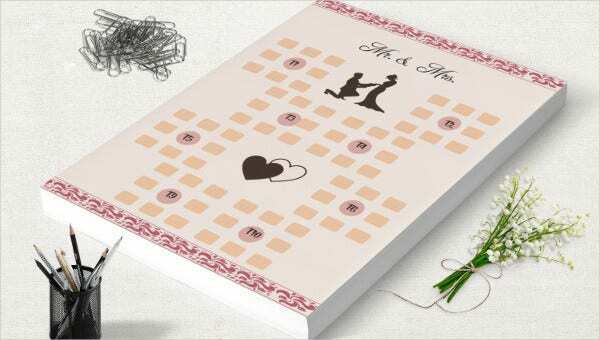 You can place the immediate families of bride and groom in the middle and the rest on both sides. 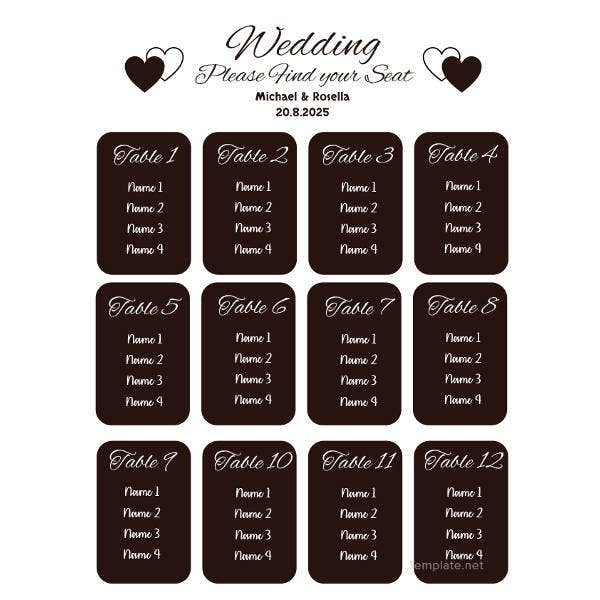 > Why Wedding Seating Chart Templates? Because planning does matters. In everything from wedding cards printing to renting the reception hall. And seating system is nothing less. 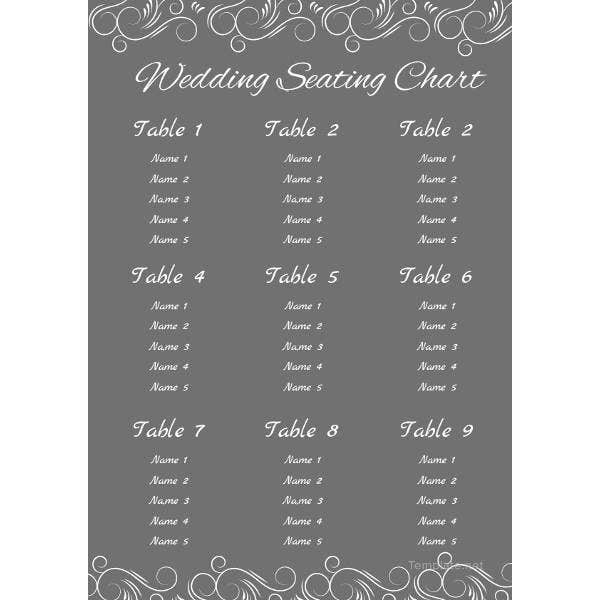 The above wedding seating chart templates can be used for dinners and ballroom club dances that happen in weddings. You can beautify these templates with some peacock feathers and even you can add your own categories to that. First thing, it takes away your stress out of creating a new thing from the scratch. It’s a great stock in your favorite designs. Now stop frantically sketching seating charts on random pieces of paper. 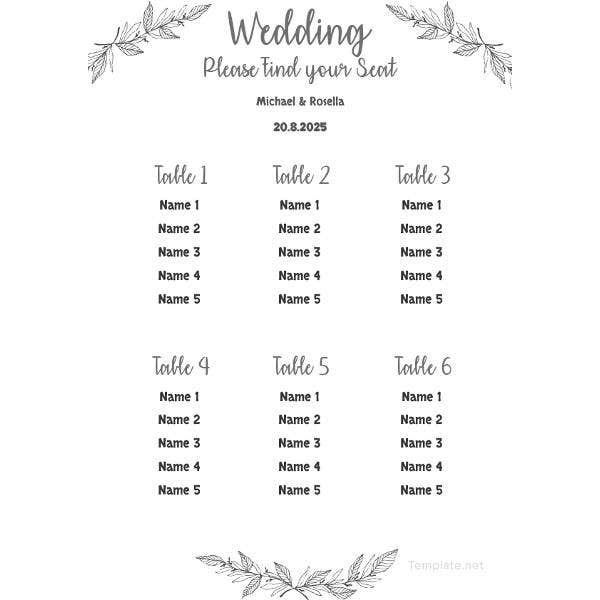 The above Seating Chart Templates are in fact a great discovery. They are so coordinated and brings a touch of sparkle to your wedding reception! They are ultimate planners. You can customize seating shapes to square, rectangle, and circle. You can even give them the numbering system. For designers, they give plenty of creative ideas that they can come up with. Get your word document printed and stick to the cupboard at the entrance of your wedding venue. It easifies your job of assisting people with their seats. Get away from the trickiest seating dilemma. The seating system is no more typical.